The European Space Agency is organising its biggest event to date, Φ-week, which will take place from the 12th to 16th of November 2018, in Frascati, Italy. Our Sentinel Hub team will be there in almost its full capacity so make sure you come and meet us. Sentinel-2 image of Frascati, in true color and a map of predicted land cover classes. Join our presentations to learn more about our work in EO research. We are supporting Phi Week Bootcamp participants with Sentinel Hub services. We would be delighted to meet you, so feel free to either contact us beforehand and make an arrangement, come to one of our digital poster sessions, or simply grab us by the shoulder and let’s go for a coffee. 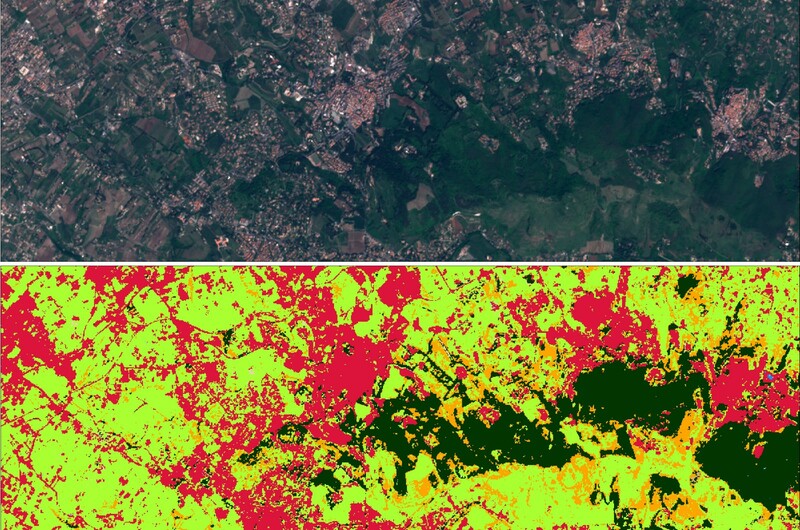 Before coming, make sure to read our latest blog post about automatic land classification, which should hopefully help with many other machine learning tasks in earth observation. It would be great to discuss how we could cooperate.